According to our statutes, for each country user group that is formed, that group will select a QGIS Country User Group Voting Member to represent their interests. These voting members are listed here. Please email trademark@qgis.org if you have registered a new country user group, or have changed your user group representative. QGIS Releases are managed by the Release Team (Release Manager and Release Assistants). Together with numerous contributors, they oversee timely, regular, stable releases of QGIS on the various supported platforms. The release team recruits and supports build managers to create packages for supported platforms and oversee the maintenance of the bug tracking system. Code Maintainers are responsible for discrete areas of the QGIS source code (core, gui, plugins, providers, tests) and ensure consistency and quality of code added into the git code repository. The QGIS community resources are managed by the Community Team (Community Manager and Assistants). 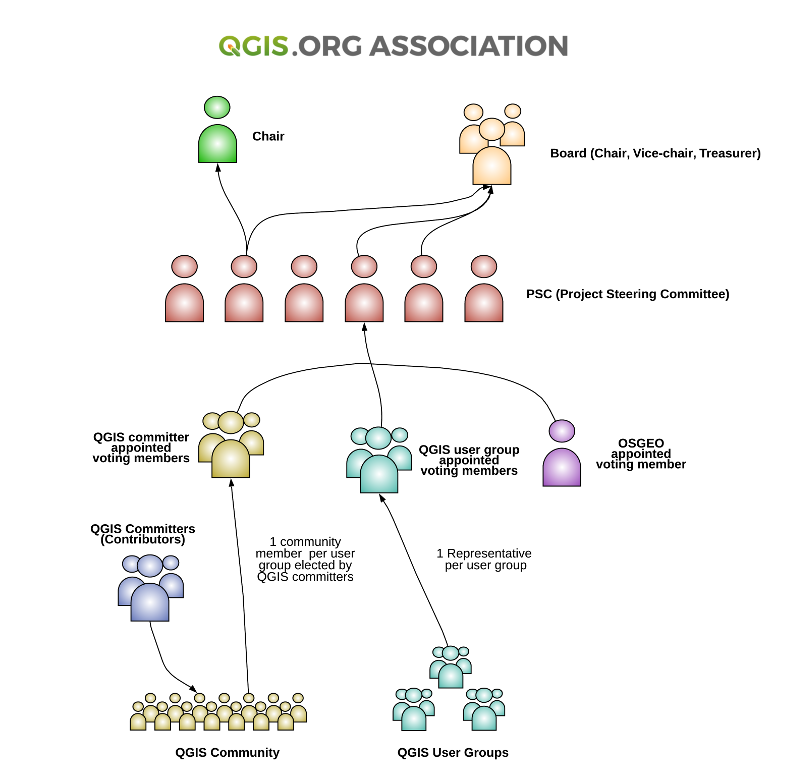 With numerous contributors they keep contact to the community, take care of QGIS events, documentation, GUI translations, and ensure smooth running of the QGIS.org online experience including web sites, blog, and mailing lists. The QGIS Translation is managed by the Community Assistant (Translation Team Lead) and supported by additional language specific teams. Information about the current documentation status and the translation process are provided at the Translators Corner. QGIS Press Material and its translations are managed by the Community Assistant (Press Material Team Lead) and supported by additional language specific teams. Information about current activities and the translation process are provided at the Press Centre. A successful project requires many people to play many different roles. Some members write code or documentation, while others are valuable as testers, submitting patches and suggestions. The number of Contributors to the project is unbounded. Get involved today. All contributions (adding code or documentation, fixing typo error, reporting issues…) to the project are greatly appreciated. These individuals are recognised as Contributors to the main code github repository. Follow the lists of maintainers of the documentation and the website. Feel free to join any of those teams.